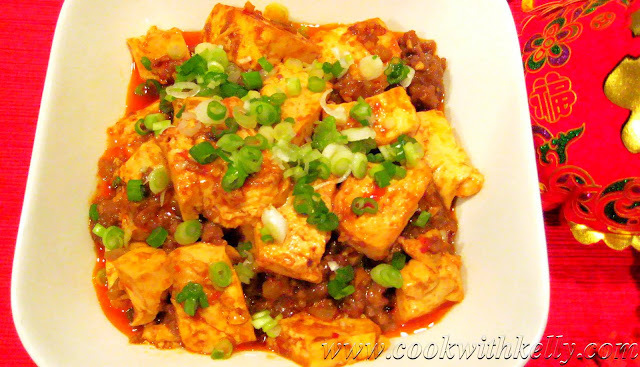 Mapo Tofu is a popular Chinese dish from the Sichuan province. The feel of any particular dish is often described by cooks using seven specific Chinese adjectives: 麻 (numbing), 辣 (spicy hot), 烫 (hot temperature), 鲜 (fresh), 嫩 (tender and soft), 香 (aromatic), and 酥 (flaky). Truly authentic Mapo Tofu is said to have all seven defining characteristics. The way I make Mapo Tofu is very simple, and when I make this dish at home I know it’s not oily and has no MSG. Marinate the beef 5 minutes before cooking. Cut the tofu into small pieces, drain the water from the tofu and set aside. In a nonstick medium saucepan or a wok, heat 1 tbsp oil over medium-high heat. Add the marinated beef to cook, until the beef is ready - about 5 minutes. Transfer the beef to a plate. Wash the pan, and then heat 1 tbsp oil over medium-high heat. Add chopped garlic, onion, bell pepper and chili broad bean paste to cook. About 2 – 3 minutes, add tofu, Sichuan peppercorn, and dried chili, cooking wine and soy sauce to cook. Gently turn over both sides for the tofu, make sure both sides are evenly cooked. About 5 minutes, add the cooked beef, gently stir for about 1 minute. Transfer to the serving plate, garnish with chopped green onion on top and you are done! !